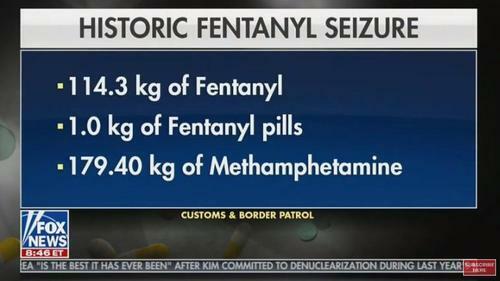 The Fentanyl shipment - which was found under the floor of the trailer - consisted of a whopping 114 kgs of the drug - compare this to the just 2mg that is considered to be a fatal dose. Agents also seized 179 kg of methamphetamine. The total seizure was said to have a street value of $102 million. The smuggler, a Mexican national, was a member of the DHS trusted traveler program (FAST) and was arrested at the border. This comes just days after the Massachusetts attorney general declared that the family behind the drug Oxycontin is responsible for the opioid epidemic ravaging the United States. Purdue Pharma and eight members of the Sackler family who own the company, are being accused of personally starting the opioid crisis by deceptively selling Oxycontin. In the conclusion to the complaint, Healey said the Sackler family used the power at their disposal to engineer an opioid crisis.